Good morning everyone, I hope you had a Merry Christmas! Here’s a unique Christmas craft project for you. We always have a kissing ball here at our house, and this year I decided to make one I could use year after year. Learn how to make your own DIY Christmas kissing ball below. 1. For a hanger, cut a length of ribbon and fold in half; staple the open ends together about 1/2″ from the ends. Spread the two small end pieces apart and pin to the ball using floral pins. 2. Start by stacking two flowers together. 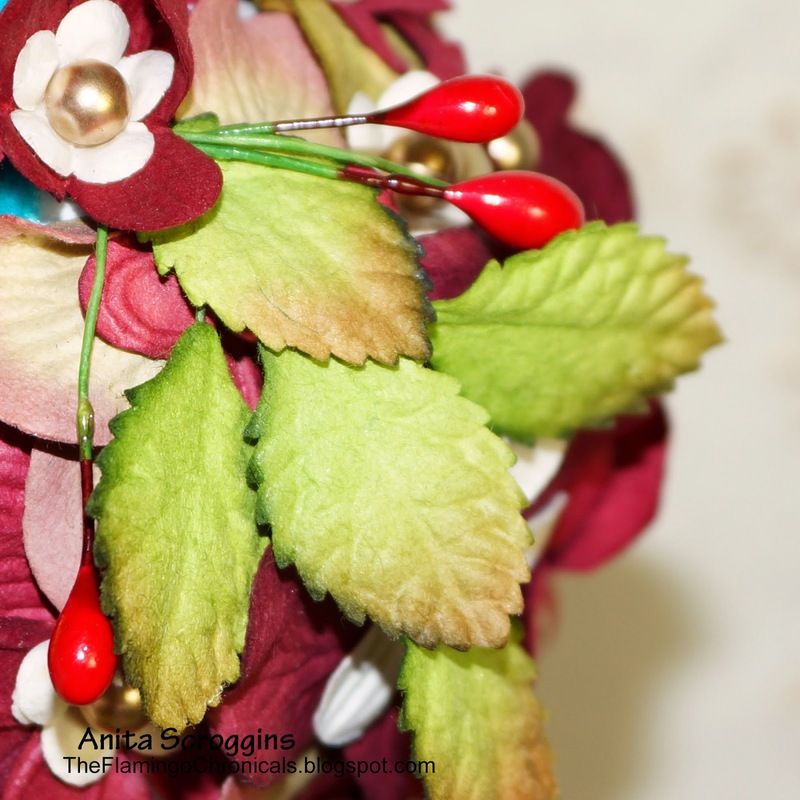 Push a floral pin through the center of the flowers then insert the pin into the ball. Continue adding flowers until the ball is covered. TIP: Start with larger flowers to fill in the background, then add smaller flowers to cover the gaps. 3. Make sprays of leaves and decorative berries. To secure, twist the wires together and wrap one of the wires around the others several times, very close together (this should be very close to the last leaf). Use wire cutters to clip the excess wire. 4. Use a paper piercer to poke a hole in the ball near the ribbon (move any flower petals out of the way). Apply glue in the hole and insert the end of the wires. Repeat for a total of 3 sprays, spacing them evenly around the top of the ball. 5. Shape the leaves in a downward direction. 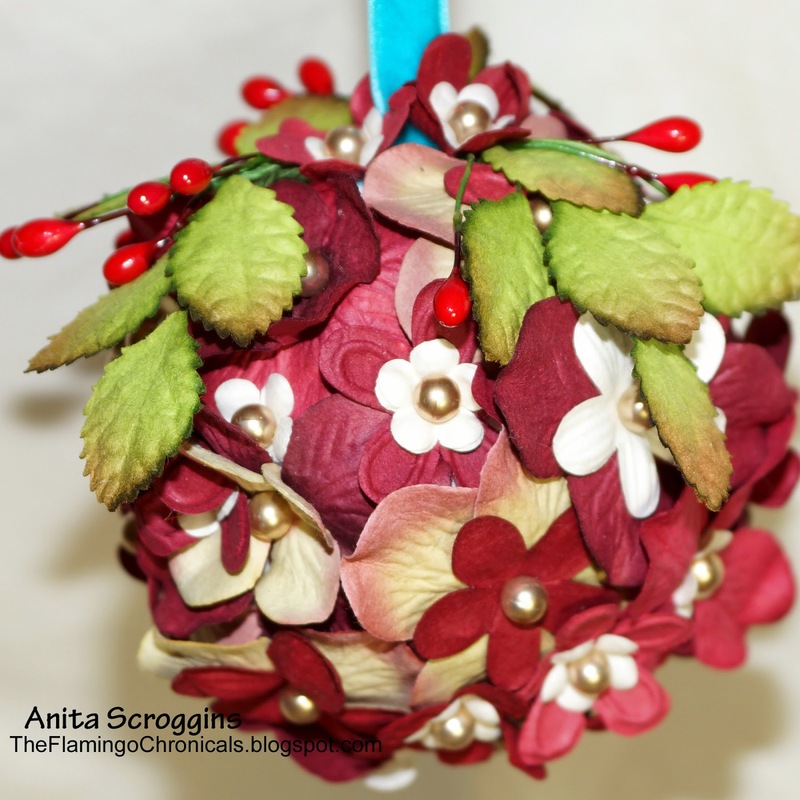 This entry was posted in Holiday Crafts and tagged Ball, Christmas, Holiday Ball, Ornaments, Red by Anita Scroggins. Bookmark the permalink.